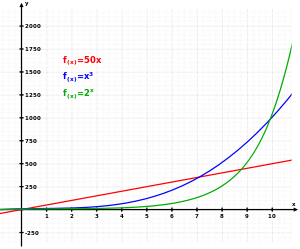 Exponential growth is exhibited when the rate of change—the change per instant or unit of time—of the value of a mathematical function of time is proportional to the function's current value, resulting in its value at any time being an exponential function of time, i.e., a function in which the time value is the exponent. Exponential decay occurs in the same way when the growth rate is negative. In the case of a discrete domain of definition with equal intervals, it is also called geometric growth or geometric decay, the function values forming a geometric progression. In either exponential growth or exponential decay, the ratio of the rate of change of the quantity to its current size remains constant over time. Since the time variable, which is the input to this function, occurs as the exponent, this is an exponential function. This contrasts with growth based on a power function, where the time variable is the base value raised to a fixed exponent, such as cubic growth (or in general terms denoted as polynomial growth). Bacteria exhibit exponential growth under optimal conditions. The number of microorganisms in a culture will increase exponentially until an essential nutrient is exhausted. Typically the first organism splits into two daughter organisms, who then each split to form four, who split to form eight, and so on. Because exponential growth indicates constant growth rate, it is frequently assumed that exponentially growing cells are at a steady-state. However, cells can grow exponentially at a constant rate while remodeling their metabolism and gene expression. Economic growth is expressed in percentage terms, implying exponential growth. In computational complexity theory, computer algorithms of exponential complexity require an exponentially increasing amount of resources (e.g. time, computer memory) for only a constant increase in problem size. So for an algorithm of time complexity 2x, if a problem of size x = 10 requires 10 seconds to complete, and a problem of size x = 11 requires 20 seconds, then a problem of size x = 12 will require 40 seconds. This kind of algorithm typically becomes unusable at very small problem sizes, often between 30 and 100 items (most computer algorithms need to be able to solve much larger problems, up to tens of thousands or even millions of items in reasonable times, something that would be physically impossible with an exponential algorithm). Also, the effects of Moore's Law do not help the situation much because doubling processor speed merely allows you to increase the problem size by a constant. E.g. if a slow processor can solve problems of size x in time t, then a processor twice as fast could only solve problems of size x + constant in the same time t. So exponentially complex algorithms are most often impractical, and the search for more efficient algorithms is one of the central goals of computer science today. , the diagonal of the Ackermann function. ^ Slavov, Nikolai; Budnik, Bogdan A.; Schwab, David; Airoldi, Edoardo M.; van Oudenaarden, Alexander (2014). "Constant Growth Rate Can Be Supported by Decreasing Energy Flux and Increasing Aerobic Glycolysis". Cell Reports. 7 (3): 705–714. doi:10.1016/j.celrep.2014.03.057. ISSN 2211-1247. PMC 4049626. PMID 24767987. ^ Sublette, Carey. "Introduction to Nuclear Weapon Physics and Design". Nuclear Weapons Archive. Retrieved 2009-05-26. ^ a b Porritt, Jonathan (2005). Capitalism: as if the world matters. London: Earthscan. p. 49. ISBN 1-84407-192-8.